OLDRIGHTIE: Will Or Can Anyone Save The UK? Will Or Can Anyone Save The UK? Probably Not Over The Next 50 years. The shameful behaviour and collusion of Bercow with our turkeys voting for Christmas as my picture indicates, is an enormous and despicable hypocrisy. By invoking the break with precedent and tradition, he swept away all vestiges of representation of the electorate by MPs. Not only that he pretty well trashed our unwritten constitution based of such precedents and showed the ignorant hypocrite for the ignorant moron he is. A wife watcher and self endorsed cuckold he is, what should we expect of such a little man promoted, as are most MPs, way above any honour, intellect or ability their positions once demanded. It began with Bliar, of course. Progressive meant change for changes sake, illegal wars and the nightmare of mass immigration. That has now morphed into a fascist dictatorship, led by the nose from Brussels, that seeks, as has now happened, with villifying all opposition as far right and to be stamped on with a ferocity last seen in 1930s Germany but now beginning to surface across the EUSSR. Greece was the fist big casualty. Now Macron is following suit as is our UK Parliament. Attack a new, common sense Party, was a blatant first big step. Now the Soubry, hinted at as a stage managed, deliberate set up but whatever, polite heckling at worst, has turned into a nasty and scary attack by the Establishment against a "far right" individual. The police are now little more than Establishment enforcers for the time being. Once the EUSSR has us firmly under their thumb, they will be usurped in favour of Islamic staffed, Europe wide and brutal, storm trooper battalions. Their brief will be no arrests, just incapacitate chosen targets physically. If you think that's rubbish, it's already happening. This clip shows old women, and men together with a violence unnecessary and though horrific, it's just the beginning. In the UK our Parliament, staffed by manifesto liars, cheats and very unpleasant remain aficionados, for now, are embracing their control over the police hierarchies to direct more obscure but still borderline aggressive tactics. Just until they've secured the full subjugation to the unelected commissars from Berlin led Brussels. Once we are subdued fully, then the violence will escalate unchallenged. Though protest is almost tolerated, for sure from the leftard side they too will fall foul of the future dictatorship. One fully in thrall to the billionaire globalists against any hint of democratic stirring. The Brits need, as they did in WW2, bury class ridden nonsense and unite without ideology and stupid, whipped up antagonism to faux class differences. We need a proper democracy. Like the one which seemed to have worked in 2016. Only to be ground down with the use of old differences of left and right stoked up for the remain cause. Just ask yourself, when did you ever hear of a hard left extremism? Since when did the Orwellian change of language to new-speak happen? Such as Nationalism becoming xenophobic? Democracy become populism. These are just tiny clues as to the horrors building. 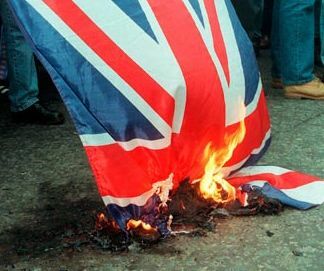 The UK can survive but we'll need that 29th of March too be a clean, total leaving of all things Nazi EU. We were lied to and duped, led by the nose back in the Heath deceit. Are we so emasculated as to let it happen all over again. The big money suggests we are. That same betting also said remain would win in 2016. However I doubt the nastiness of our Establishment will permit that to happen again. Especially with the treacherous likes of May and hundreds of others privy to so much we shall never be allowed to know. As so often is the case when a nation has been ruled by a foreign power for such a long time it loses the agility to govern itself. One glance at the duplicitous mess that passes for a government now shows this to be indisputably the case in UK. 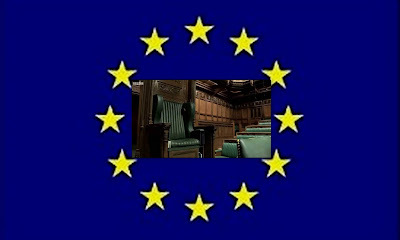 Where we go from here is anyone's guess but rest assured the so called elected representatives of you the British public will do what's best for them and to hell with democracy and you the voters. Thank you both. Anon (2), very pertinent observation and further proof of the need for a total, clean "no deal" Brexit.